Buy Make up brush belts online at Boozyshop. The make up webshop that makes online cosmetics shopping fun! It is an often heard problem, many ladies are looking for a practical way to store their make up brushes in a neat way, but also want to have them easily at hand while applying make up. That seems a bit difficult at first, but in reality it is not, on the contrary. By buying a make up brush belt you ensure that you can enjoy the best of both worlds. On the one hand, the makeup brushes are stored away in a really safe way, while on the other hand you can wear the belt whilst applying the make-up. You will notice that making yourself even more beautiful in this way will be even more fun! A make up brush belt can be ordered here at Boozyshop in various sizes. We distinguish in this area the medium of the large version. The medium version is perfect for ladies who have a total of maximum 18 brushes. By choosing a medium belt they can easily take all their brushes on holiday without having to worry about damage. Do you have more than 18 brushes and therefore fear that you will not be able to use a make-up brush belt at all? That fear is absolutely unnecessary, on the contrary. In the assortment here at Boozyshop you can also find a large version where 36 brushes fit. So ladies who have a very large collection make up brushes, can also get a belt without any problems. Many ladies have been looking for a while for a simple and practical way to take their makeup brushes with them on holiday. However, that is not as easy as it seems. It goes without saying that the brushes have to be well protected along the way. In addition, they must still be relatively easy to extract and, for example, they must be properly dried, also on the road. In all these cases you will notice that buying a make-up brush belt is an absolute must. A belt can be attached very easily around every waist which ensures that it can really be worn by everyone. Are you still looking for a way to take your brushes with you on holiday? Then look no further and choose to buy a make up brush belt here at Boozyshop today! If you look at the makeup brush belts from the assortment here at Boozyshop, it is immediately obvious that these are made of a very beautiful and high quality material. The belt has a beautiful leather look which is not only very durable, but also very easy to maintain. Moreover, the belt feels very smooth, which makes you think of real leather. When you buy one of the make up brush belts from the range here at Boozyshop, you can always count on an excellent specimen that you will certainly enjoy for a long time. Do you want to order a make up brush belt? Chances are that the above information has convinced you to also get a make-up brush belt in your stash. Ordering such a belt here at Boozyshop always ensures that you can count on some very interesting benefits. 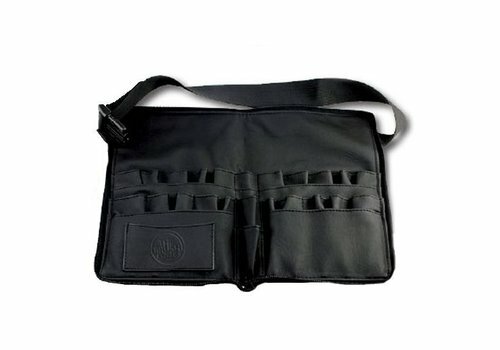 First of all, for example, our make-up brush belts are very interestingly priced. Despite the very nice and luxurious appearance you can get such a belt at home for an absolute bargain price. However, that is not all. Did you place an order worth at least 30 euros, you can count on a great free gift.